(CNN) -- Michael Phelps is set to return to competitive swimming after completing a three-month suspension following the publication of a picture apparently showing the multi-Olympic champion using illegal drugs. 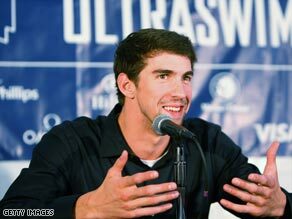 Phelps talks to the media ahead of his return to competitive swimming on Friday. The 23-year-old, who made history by becoming the first person to win eight gold medals at a single Olympic Games in Beijing, was handed his ban by USA Swimming in February. The American, who eclipsed compatriot Mark Spitz's previous record of seven titles with his efforts in China, will make his return to action at the Charlotte Ultraswim in North Carolina. Phelps will compete in the 100metres butterfly and 200m freestyle on Friday, the 50m free and 100m backstroke on Saturday and the 100m free on Sunday. He admits he is uncertain what the initial outcome will be following his enforced lay-off. "I'm not sure what's going to happen," Phelps told his hometown newspaper the Baltimore Sun. "But I'm really excited just to have the opportunity to race. I haven't had that opportunity until now, and that's the one thing I love about swimming is the racing aspect of it. Whatever happens happens. We'll go back to the drawing board from there." Adding to the uncertainty is Phelps' choice of events for the first meeting of his build-up to the 2012 Olympics in London, a program that reflects an emphasis on shorter distance events. Among those event dropped from his Beijing individual program are the 400m individual medley and the 200m butterfly with only the 100 butterfly and 200m free retained, while Phelps has added the 50m and 100m free events as well as the 100m backstroke, in which he will face world record holder Aaron Peirsol. He also underlined his ongoing commitment to swimming as his countdown to London 2012 begins. "I feel like I have unfinished business," he said. "There are still things I want to accomplish before I'm finished in the sport. I'm not going to be done until I do that, and I think I can do it in the next four years."